UPSC Civil Services Exam Prelims 2019 Registrations, How To Apply?, UPSC Civil Services Exam Online Application Process. last date to apply for UPSC Civil Serives Prelims Exam. Union Public Service Commission, UPSC has released the official notification for the Civil Services Prelims Exam 2019 on the official website upsc.gov.in. The online application forms for UPSC Civil Services Prelims 2019 are now available on upsconline.nic.in. As per the notification, Civil Services Preliminary Examination, 2019, including Indian Forest Services or IfoSE Prelims 2019 Online application form would be made available from February 19, 2019 till 1800 Hrs on March 16, 2019. The candidates who are interested in applying for the Civil Services Preliminary Examination 2019 can now fill the online application forms. Union Public Service Commission, UPSC is presently accepting online application for Civil Services Preliminary 2019 examination and Indian Forest Services 2019 Preliminary examination. The online application for UPSC CSE Prelims 2019 is currently available on upsc.gov.in and upsconline.gov.in. The last date to apply for UPSC IAS, IFS Preliminary examination is March 18, 2019. Application window would close at 6 pm. Candidates hence should ensure that their applications are complete before 6 pm on March 18. Candidates can attempt the UPSC Civil Services examination a total of 6 times. The age limit for UPSC CSE 2019 is 21 to 32 years of age, calculated as on August 1, 2019. Minimum educational qualification is a graduate degree. Also, only Indian Citizens are eligible for the UPSC Civil Services. Candidates are advised to go through the detailed notification before filling the online application form on upsconline.nic.in. As for the fees, please note that the option to pay the fees by cash would be de-activated by 11:59 pm on March 17. Candidates would not be able to generate the Pay in Slip after that time. Candidates who have generated the slip may pay till closing hours of the bank (any SBI Branch). Online payment can be made till 6 pm on March 18, 2019. Candidates interested in applying for Civil Services (IAS, IPS, etc.) 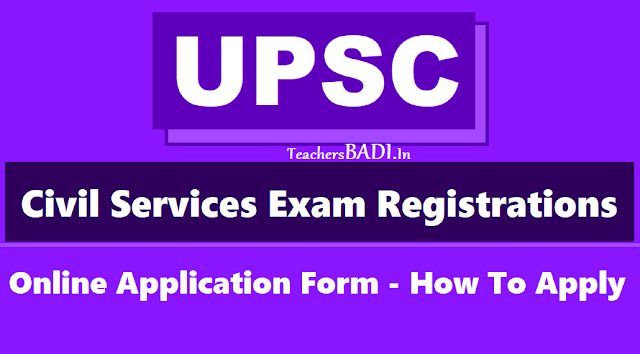 or Indian Forest Services are required to fill the UPSC Civil Services Preliminary examination 2019 application forms. The examination would be conducted on June 2, 2019. Admit cards would be released on upsc.gov.in in the month of May 2019. Please note, the application forms are now available. As per the UPSC Calendar, the notification for the Civil Services Preliminary Examination 2019 as well as the Indian Forest Services Preliminary Examination 2019 would be released. The applications would close on March 16, 2019. Civil Services Prelims 2019 Examination is scheduled for June 2, 2019. All interested are advised to note that the selection of the Indian Forest Services has to apply for the Civil Services Preliminary Examination. The Prelims for Indian Forest Services, IFS are done alongside the Civil Services Prelims. The notification would release with the details of the examination and updated here. Also note, the application forms would be made available on upsconline.nic.in. UPSC Civil Services Notification 2019: Prelims applications process to begin @ upsc.gov.in: Union Public Service Commission (UPSC) will begin the online registrations for civil services preliminary exam from February 19, 2019. Candidates can expect the UPSC official notification and begin its online application process. The application forms will be uploaded online at the official website of UPSC- upsc.gov.in. Union Public Service Commission, UPSC has activated the registration link for UPSC Civil Services Prelims 2019 examination. The online application forms for UPSC Civil Services Prelims 2019 are now available on upsconline.nic.in. The detailed notification would be released shortly on upsc.gov.in. Vacancy details, eligibility and other important information would be released by UPSC in the detailed notification. Also, apart from IAS and IRS services, UPSC CS Prelims 2019 are also the qualifying examination for Indian Forest Services. The eligibility, age limit and other details are summarized below for quick reference. Please note that the online application has started on upsconline.nic.in. Instructions on filling the online application forms would be listed out. Interested candidates are advised to carefully go through the official notification once it releases. Candidates have to fill the online application form. The online application forms is a two step process – registration and filling of online application forms known as Part I and Part II. The link is now active on upsconline.nic.in on 19-02-2019. After filling the online application forms, candidates would be required to pay the fees. UPSC Civil Services 2019 application begins at upsconline.nic.in. Go to UPSC official application website: upsconline.nic.in. Click on the 'ONLINE APPLICATION FOR VARIOUS EXAMINATIONS OF UPSC' link. Click on the link given for part I registration. Click on the yes button after reading all the instructions. Now fill all the required details correctly for Part I registration. Pay application fee. Select your exam centre. Upload your photo, signature, and photo identity proof in the recommended format and size. Accept the declaration and submit your application form. The application process will not be complete without application fee payment. Application fee can be submitted via Credit card/debit card/Internet banking. How to apply for UPSC Civil Services Exam Prelims 2019? Direct Link: Apply Online for Civil Services Preliminary Exam 2019. As per the official notification, “Applicants should note that there will be a ceiling on the number of candidates allotted to each of the Centres except Chennai, Dispur, Kolkata and Nagpur. Allotment of Centres will be on the 'first-apply-first allot' basis, and once the capacity of a particular Centre is attained, the same will be frozen. Applicants are, thus, advised that they may apply early so that they could get a Centre of their choice.” Therefore, applicants must apply at the earliest and get a convenient centre. Remember that application forms without fee payment would be rejected. Also, candidates are not required to send the physical form anywhere. The last date to apply online is March 18, 2019. All the candidates are again advised to carefully go through the instructions before filling the online application forms. Candidates are informed that the UPSC civil services examination (CSE) 2019 preliminary level will be conducted on June 2, 2019. The main examination for UPSC civil services exam will be conducted on September 20, 2019 . The main examination for UPSC Indian Forest Service (IFS) will be conducted on December 1, 2019. Apart from this, only Indian citizen can apply for IAS, IFS (Indian Foreign Services) and IPS services. For other posts, the following candidates are also eligible to apply, provided they have the necessary certificate issued by the Government of India. a. Educational qualification: The candidates must have a degree from an esteemed University incorporated by an Act of the Central or State Legislature in India or other educational institutions established by an Act of Parliament or declared to be deemed as a University Under Section-3 of the University Grants Commission Act, 1956, or possess an equivalent qualification, to appear in the exam. A registration number will be generated which candidate has to note down. The applicant has to pay the fees and select the centre, upload scanned photograph and signature. The UPSC recruitment consists of a three-level exam including prelims, main and interview. Candidates have to qualify all three levels. The candidates shortlisted after prelims examination will be called in for Main exam. The candidates who qualify main exam will have to appear for personal interview. The final selection list of the candidates who appeared for these process will be released on the official website.